During the summer, the city really comes alive with back-to-back music events. From outdoor concerts in the park to weekend ragers at Governors' Island, there's an endless list of musical soirées to hit up. But whether you're in NYC or L.A., the summer concert uniform remains the same: frayed denim shorts with a band tee. 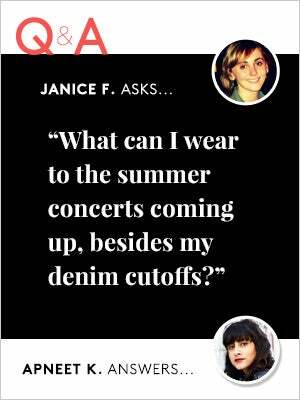 Janice F. from D.C. asks, "I'm going to a few concerts this summer and I'd love to wear something besides my usual jean cutoffs. Any ideas for something different?" Absolutely, Janice! See how I'm deviating from the typical T-shirt-and-jeans ensemble, ahead. I suggest going for a tea length skirt instead of cutoffs. The vibrant cobalt blue of this Lipstotoes skirt is striking enough to be a standout piece, but the shape of the skirt is simple so it's not over-the-top. My undying love for crop tops gets satiated in the summertime. You can usually find me wearing something like this retro floral print number. For some edge, I'm wearing these studded Candela flats, and popped on a hat to tie everything together. Now that you have a new concert look, the difficult part is figuring out where to groove. Lipstotoes Maxi Swing Skirt, $34, available at Lipstotoes, Candela shoes, vintage top and hat.